I decided to do a little wardrobe editing yesterday. Culling my closet is a rather cathartic exercise for me. I know, I'm rather strange that way. Despite its minuscule size, I was still able to fill out 2 bags of unused clothes to be given to the charity shop. Most were inexpensive purchases from High St stores picked up during the sales. I was appalled to find out how expensive they actually were when I factored in cost per wear. Conversely, I'd bought a few stunning Phillip Lim 3.1 tops many years ago at a fraction of the retail price but I'd worn these everywhere, from meeting with girlfriends to dinners and they still look like new 4-5 years later. This has just reaffirmed my belief to invest in fewer but timeless pieces that transcend trends. 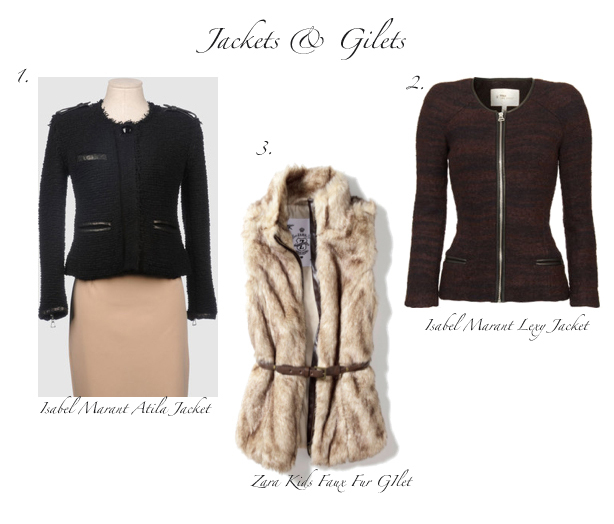 I've fallen head over heels with Isabel Marant and Iro jackets. They're meant to worn almost carelessly over a plain t-shirt and a pair of well worn jeans or skirt. These will work as a good alternative to my thick winter coat. While I'd love to own a brand new Chanel RTW jacket, they're well beyond my budget and will continue to be so in my lifetime. Their price increases are truly insane - in fact a medium 2.55 (or was it Jumbo) was £1600 in July 2010. When I inquired again in August, the price had skyrocketed to £2100. That's more than a 30% increase! I hope there's a logical explanation for this. Perhaps the hardware is made of 24K solid gold or the lambs were fed with organic grass and rubbed down everyday by highly trained masseuse in order to produce better quality leather. I've been on a hunt for a faux fur gilet since last year. I was almost breathless with excitement when I saw one hanging on the arm of a customer at the Laura Ashley sale. I stalked her as she walked around the store and into the fitting room while I hung around hoping it wouldn't fit her. The minute she put it back on the rack, I pounced. Boy, was I ecstatic despite thinking it looked a little off when I tried it on at home. Hubby, on the other hand, walked into the bedroom and burst out laughing. The joker said that I looked like an overgrown beaver in the gilet. Pfffffft. I'm sure PETA supporters will hate me for saying this. I'm not anti-fur. However, the last time I was in the presence of a rabbit fur gilet, I couldn't stop sneezing. I found a faux fur gilet at Zara kids for £22.99. The VAT savings will probably have to go to my tailor to have it cropped a few of inches. If you wear UK 8, you can get away with XL sizes at Zara Kids. Thanks, Sharon! Hmm...I won't call myself tiny. I'm more of a pudgy US 4/UK 8 :P Those Dicker boots were sold out EVERYWHERE in France. Insane! I'm now looking for an alternative. Love this post!! I'm around your size so I'll try out Zara kids!! We just got one here somewhat near my house. I now officially need the IM Atila jacket. Have you tried it on to see how the sizing compares with the Lexy? A similar gilet from their TRF or women's section range from £39.99 upwards. The black Atila reminds me of a Chanel boucle jacket I'd been admiring for a while. It runs a little larger than the Lexy. BTW, it's from their 2009 F/W collection. I've got the jacket in size 1. The armholes are slightly narrow as are all her jackets but the rest of the jacket is fairly roomy. I can wear it under a jumper. Do you want photos of it? I have an old fur jacket that would make a wonderful vest, now you got me inspired to get it altered! My boyfriend is on the war path to find me one of those furry gilets! Its so much fun. We get into the mall and he zooms over to where they're displayed and has me try them on. I regret not letting him get me one about a year ago--they can get SO big, no? Chanel is getting obscene, by the way. More reason to stroll on over to Hermès. Lily, that's a fantastic idea to recycle and update an existing piece in your closet. Amy, it's a beautifully constructed jacket. AA, LOL. Lucky you! I've tried on so many gilets. Despite the fact that mine came from Zara Kids, I still need to get it cropped. I know I'm rather *ahem* dwarf like but they must make these for giant kids. I fell in low with a gilet from Kors by Michael Kors but it's difficult to get my hands on one from this side of the Atlantic. I can't justify the price increase. I agree with you about investing in Hermes instead. Kat,since the chances of me acquiring your stunning black Chanel boucle jacket is next to nil, this is my alternative. Loving your jacket and gilet selections! My husband makes fun of me too about my fur love - I have 2 faux fur vests! And that Elle McPherson picture has been one of my inspirations (but she seems to make everything look good)! And LOL @the chanel comment! I bought mine from Myer, Perth for last winter. It was on sale for $49.90. Our winter is so mild so it was just nice to wear when I fetch my kiddies from school. I usually put on a proper jacket in the morning as it can get a bit chilly, Perth standard.I'm not sure whether it's a faux fur or a rabbit fur though..
Sam, men just don't get the faux fur love. Ah...Elle McPherson. My girl crush. She can don on a garbage bag and she'll look good. Mrsallan, I'm always amazed my best friend tells me her daily outfits she wears during winter over in Perth. Meanwhile, I look like the Michelin man in 5-6 layers of clothes. I'm kinda on the hunt for a (faux) fur vest too! There are a lot of choices out there but I guess it's looking for the right fit. I saw one by Michael Kors (his lower priced line) which is quite reasonably priced but I've yet to try it out.